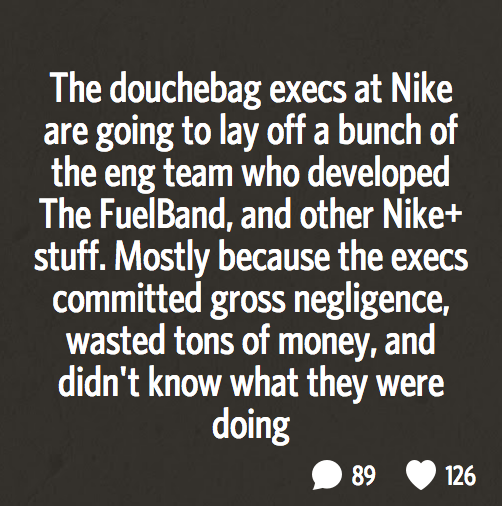 Bad news, Fuel fans: Nike is purportedly killing off their wearable hardware efforts, including the FuelBand. Now, sure enough, CNET says they’ve got a person-in-the-know confirming that the majority of the 70-person FuelBand team has been let go. It’s a pity, really; despite never really finding a massive audience, the FuelBand is/was a damned slick piece of hardware. It was hardly perfect, but it did some things — like its super pretty dot matrix display — quite well. So why might Nike be heading for the exit? Because the wearables market is about to get really, really crowded — primarily by devices that will do everything the FuelBand does, and more. On one hand (wrist? ), you’ve got Google, who just launched an entire branch of Android dedicated specifically for use with devices like smartwatches. On the other, you’ve got Apple, who has supposedly been brewing up a wearable device of their own for months now. And guess who’s on Nike’s board? Apple CEO Tim Cook. Throw in the fact that Apple’s Worldwide Developer Conference is right around the corner, and the pieces seem to fit together almost too well. If Apple was ever going to let Nike know that it might be time to get out of the dedicated-wearables game, it’d be right about now.